Distributed by - Warner Bros. 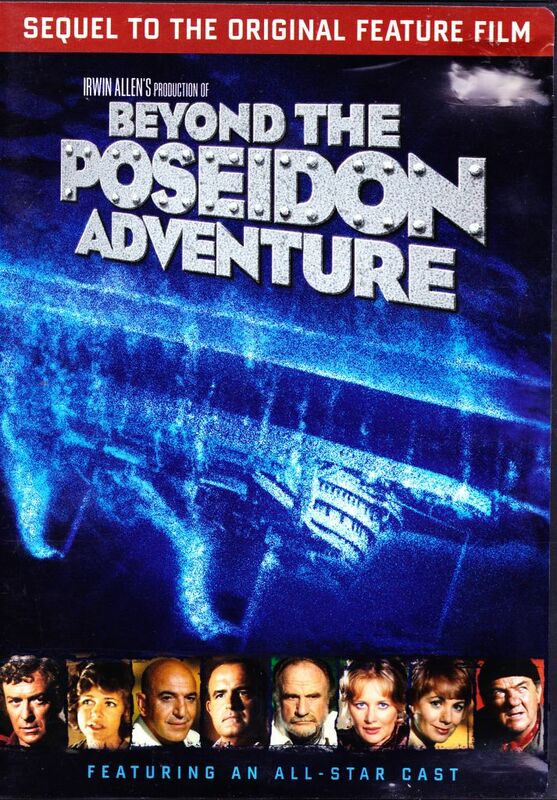 Beyond the Poseidon Adventure is a 1979 American disaster film, a sequel to the 1972 film The Poseidon Adventure. It was directed by Irwin Allen and starred Michael Caine and Sally Field. The film was a critical and commercial failure, highly disliked by co-star Angela Cartwright, and was the only Allen disaster film not to receive any Academy Award nominations. The film continues the story from the original movie's conclusion. The Poseidon is still afloat, and the six survivors of Reverend Scott's team have been rescued. A tugboat captain, Mike Turner, discovers the wreck of the ship. Accompanied by second mate Wilbur and passenger Celeste Whitman, he heads out to claim salvage rights on it, as the tugboat Jenny lost her cargo in the same storm that capsized it. They are soon followed by Dr. Stefan Svevo and his crew, who claim to be doctors who received the ship's SOS. They are actually after gold and a lost plutonium shipment. They board the doomed vessel and become trapped. The group with Turner also encounters the ship's nurse, Gina Rowe, a passenger named Suzanne Constantine, and war veteran Frank Mezzetti who is searching for his missing daughter (Theresa Mezzetti), which they soon find along with the elevator operator Larry Simpson and as well as a "billionaire" named "Tex". Later they find the blind Harold Meredith and his wife Hannah, who were waiting for rescue. The water continues to submerge more decks and more explosions occur. Turner and his group find Svevo and his men gathering a cargo of plutonium. He tells Turner that he can't let them go now that they've seen what he and his men are doing. However, before they can kill Turner and his group, another explosion occurs, allowing them to escape. Svevo and his men gather the plutonium and head back up to the ship's stern, which is still above water but is slowly sinking. In another section of the ship, Turner and his group find a gold treasure worth $1 billion. They gather it and escape from the ship through an underwater side door. They swim to his boat as Svevo's men see them and open fire. However, Turner's group makes it to his boat and they sail away. Water continues to flood the ship and cause the on-board boilers to explode, which causes the cargo of plutonium to do so. The ship completely explodes, killing Svevo and his men. On board Turner's boat, Celeste admits her love for him and they sail away into the sunset with the survivors and gold treasure. The version shown on television contains 20 more minutes of footage. This extra added footage has not been released on the new DVD. There is an independent DVD available that does have the TV footage. In 1973, soon after the first film came out, producer Irwin Allen proposed a sequel that would have had the survivors testifying in a hearing on the disaster in Vienna, country of the Poseidon's parent company. While on a train to the hearing, a miles-long mountain tunnel would collapse, leaving the survivors of the train trapped inside, struggling to make their way out. This premise was eventually used in the 1996 Rob Cohen film Daylight with Sylvester Stallone.